Tagging Articles is an extremely useful feature within Elevio. By tagging an article with keywords and matching those keywords to different pages on your site, you can control which suggestions show on your pages, providing the most relevant help possible. From your Content Management Dashboard, select the article that you want to edit and tag keywords to. In the right hand pane of the Article Editor, refer to the Keywords section. Tag the article with relevant keywords. These keywords will then influence where and how the article is suggested. To influence the list of suggested articles appear in the Assistant on a certain page, you can tag keywords to pages. This means your users won’t need to go looking for the most pertinent information. To tag Pages with suggestions, head to the Per Page Settings (https://app.elev.io/pages) section (under the Deliver menu). In the URL section, you can paste in the exact URL of the page you want to tag. If you want to tag a group of pages, you can modify the dynamic part of the URL to (. *) as a wildcard, so the tag will apply to any URL’s which have the rest of the address in common. For example https://www.mysite.com/users/(. *)/view will work when any user number is substituted in for the wildcard. Scroll down to the Keywords field. Enter the same keywords that you used in an article if you want that article to display as a Suggestion on that page. 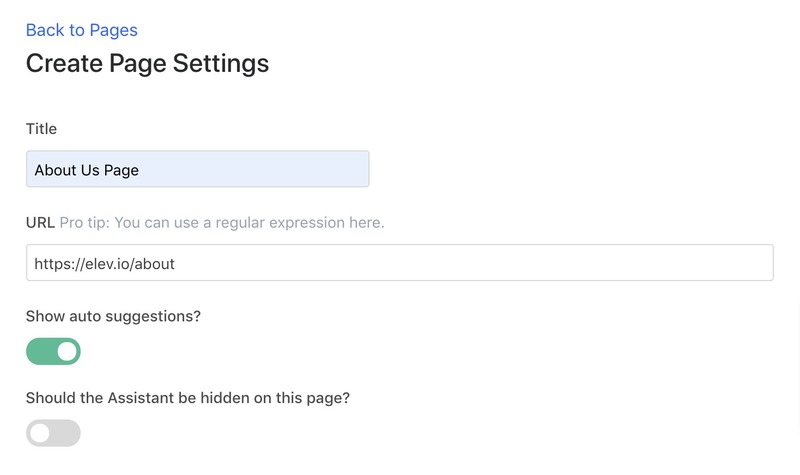 If you want to use regular expressions, use this tool to help crafting your regular expression. You'll notice that Elevio shows "Suggestions" even if you don't tag any articles. Until the algorithm learns which articles to suggest, it will choose articles that match keywords in the URL. 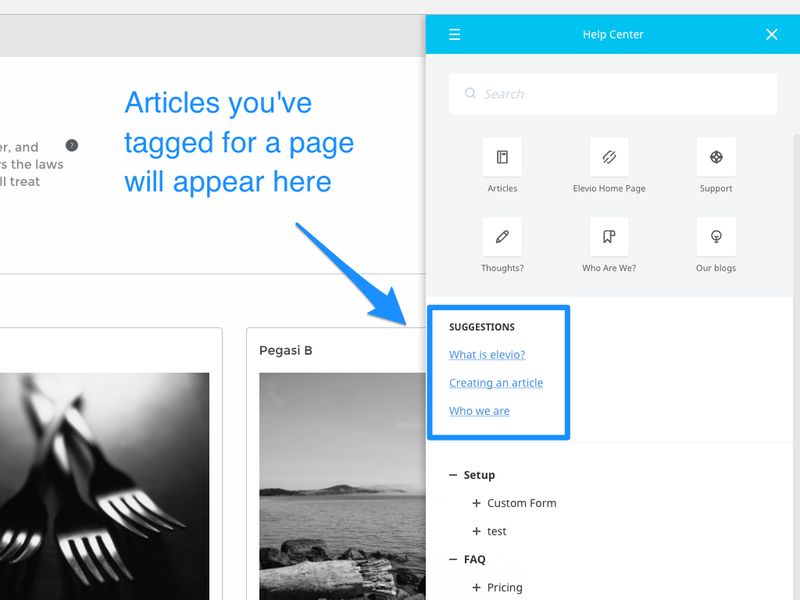 As it learns which articles users need, it will put those into suggestions. How does Elevio deliver the right answers?